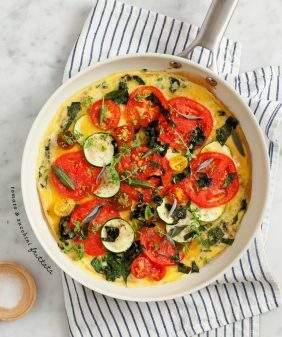 This flexible vegetarian spinach frittata recipe makes an easy dinner or crowd-pleasing brunch! Add your favorite spices or cheese to customize it. Here’s another fast, simple, “non-recipe” recipe that I make pretty darn often. What I love about a frittata is that the effort required is similar to making scrambled eggs, but somehow the end result is fancier. (And yes, I make my scrambled eggs with piles of greens and things). 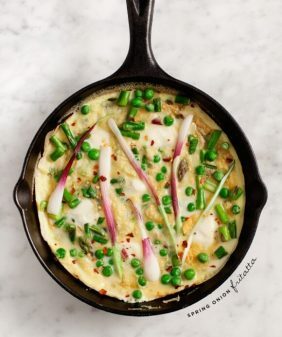 Frittatas are also my go-to dish for brunch entertaining. Because, let’s face it, who wants to get up on a Saturday morning and really cook. Not me. Pop your frittata in the oven and pour the mimosas! 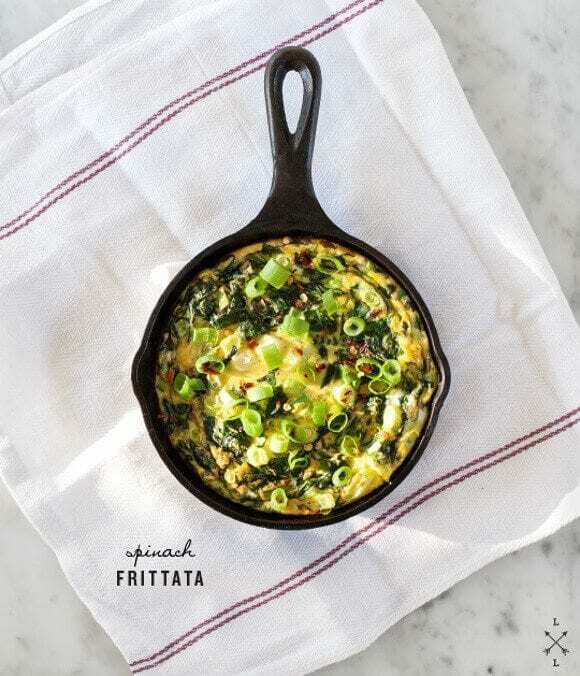 Frittatas are my go-to brunch entertaining dish, and this simple spinach frittata recipe is one of my favorites. 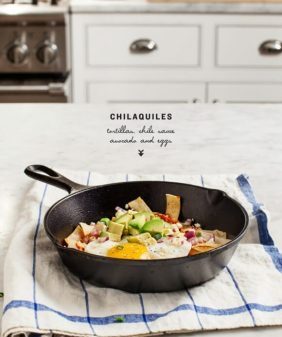 Scale the ingredients up or down depending on the size of your skillet and the number of people you're serving. Crack the eggs into a medium bowl and whisk them together with the milk, salt, pepper, minced garlic, and any spices you want to add. Set aside. Place the cooked spinach into the egg bowl with the sun dried tomatoes, if using, and gently mix. 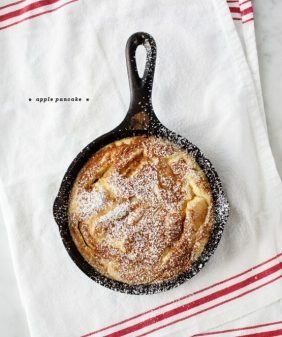 Pour the whole mixture into your cast iron skillet (add some cheese on top if you want to) and bake in the oven until it puffs up and becomes golden brown. My skillet was a 5″ mini skillet, so I cooked mine for about 20 minutes. If you have a larger skillet and a bigger batch of eggs, you will need to cook it longer. Just watch it and poke at it a bit until your eggs are firm-ish and cooked. Remove from the oven and let cool. Slice and serve. *Note: If I weren’t using a mini skillet too small for my stove burner, I would have just added my eggs to the spinach pan after I was done sautéing the spinach, and then moved the whole thing to the oven. I would have dirtied one less pan that way, so I suggest that method if you’re cooking for more than 2 people. Gorgeous! 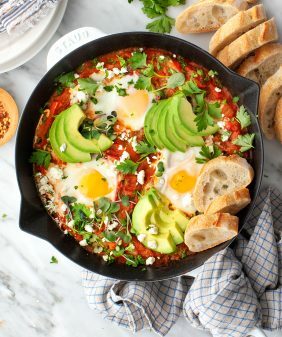 This fits one of my favorite recipe categories – Simple (but impressive) Brunch Recipes. The colors in your photography are beautiful, too. I appreciate no recipe recipes- leaves room for interpretation! This looks great! Simple yet savory and delicious. I just made kale mushroom frittata for dinner last night! Your spinach version looks really good! Thanks for the inspiration! 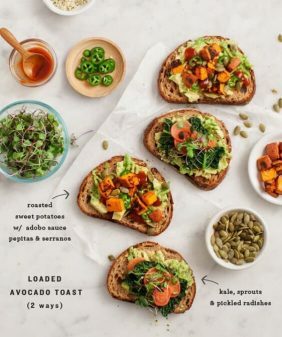 I read this last night and made it for breakfast this morning. I loved the clear instruction for additions and/or subtractions and other ideas. I made this in a 8 inch pan so I did 8 eggs, lots of spinach, leek and swiss chard. It was wonderful! I loved that I only dirtied one pan and the preparation went super fast. Just what a needed–thanks! sure, glad you liked it… sounds delicious, I love leeks & chard! Beautiful! Every time I make a frittata, I wonder why I don’t do them more often! Their like an omelette, but easier! Leftovers would make a great packed lunch too 🙂 Beautiful! I printed this recipe out so I could make it on Sunday morning, but my husband surprised me by making it on Saturday morning. It is that easy and so very delicious!